I first made a cake like this last year, when I made a Skinny Mountain Dew Cake. I loved that cake and knew there would be many more versions to come. All you do is mix a cake mix and a can of soda and that's it, no butter, no eggs, etc . . .
You can really use any cake mix and any flavor of soda you would like and you can't actually taste the soda in the finished cake. 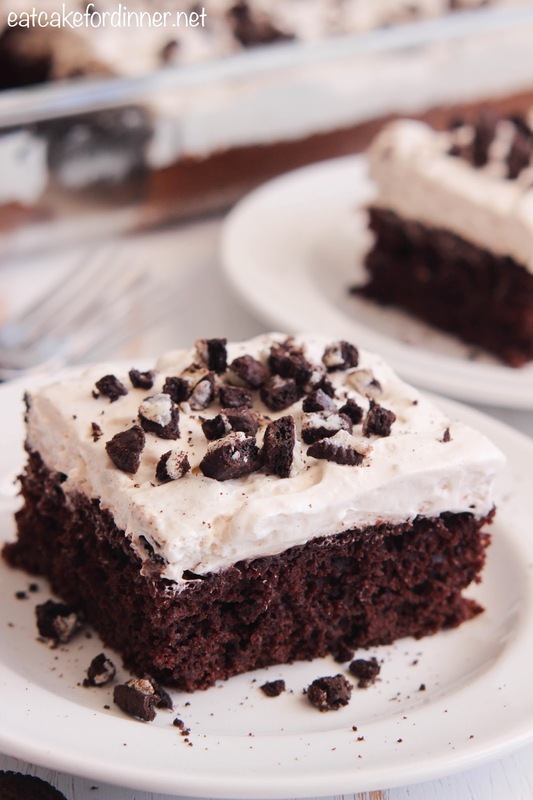 The texture is a little different than a traditional cake, but I think it's so good and the light frosting is the perfect topping. A big piece of cake that I don't have to feel guilty about eating is a total win in my book. Here is the calorie breakdown for the ingredients that I used. Of course, depending on the brand of ingredients you use, these numbers could vary. 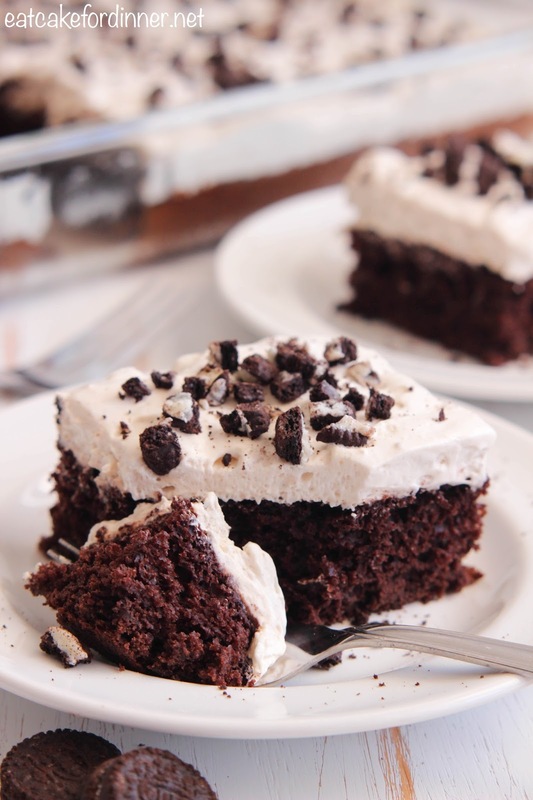 Cake mix (1600 calories), Diet Coke (0 calories), pudding mix (480 calories), light whipped topping (500 calories), 1% milk (50 calories), 9 mini Oreos (140 calories). That is a grand total of 2,770 calories divided by 15 servings equals 185 calories per piece of cake. Not too bad, right??? That is a fraction of the calories you would have from a traditional cake made with eggs and butter and topped with buttercream frosting. I also shared this recipe over at THE RECIPE CRITIC's site. Click HERE to check it out. 9 mini OREOS, chopped, opt. Preheat oven to 350 degrees. Spray a 9x13-inch baking dish with cooking spray; set aside. In a large bowl, combine the dry cake mix and the Diet Coke. Whisk together until just combined. Do not over mix. Bake for 25-28 minutes or until a toothpick inserted in the center comes out clean. Cool completely. For the frosting: Whisk together the dry pudding mix, milk and vanilla until combined. Fold in half of the Cool Whip and then fold in the remaining half of the Cool Whip. Spread over cooled cake. Garnish with chopped Oreos, if desired. Cut into 15 squares and serve. Keep leftover cake stored in the refrigerator. I'm going to have to try a box of cake mix and a can of soda. I can live with 185 calories per slice! Looks super yummy, pinned!